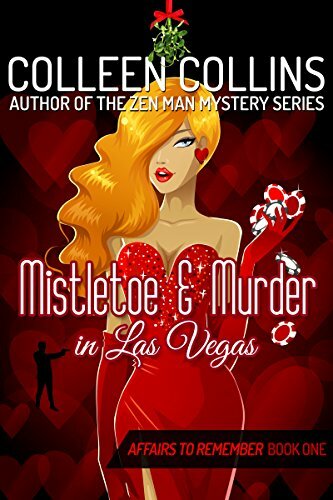 Mistletoe & Murder in Las Vegas is free on Sunday, October 23! Click on book cover to go to Amazon page. Four years ago, my husband and I taught a series of classes for Kiss of Death, the mystery-suspense arm of the Romance Writers of America. We focused our workshop on private investigations, a field we know well after having being co-owners of a private investigations agency for years. This post is part I of the class on crime scenes (with some information updated). A point we make throughout the class is that PIs mostly investigate crime scenes after law enforcement/others have finished their investigations and re-opened the crime scene back to everyday use. You'd be surprised how much evidence can still be mined days or weeks later at a crime scene—for example, this last weekend we visited a former law enforcement crime scene and took photos of a strategically placed surveillance camera, not documented in the D.A.s discovery, that provided key evidence in a legal case. Years ago, we investigated a crime scene, 800-plus acres of ranch land, that the sheriff's office had investigated and returned to everyday use two months earlier. Our goal (as had been the sheriff's office) was to find 4 bullet slugs from a shooting, whose placement could prove a man's innocence. The next class discusses this case in more detail. Why Do Crime Scenes Matter? In some crimes there are no witnesses and in the absence of self-incriminating statements by a suspect, the only means of obtaining a conviction may be through physical evidence (such as evidence with viable DNA, a blood sample or a fingerprint). In any crime, sharing knowledge of physical evidence with suspects may loosen tongues and stimulate confessions. DNA, fingerprints or serologic evidence are tough to debate and bring many criminals to a place where their lips move easily. Note: A comment regarding an investigator sharing knowledge of physical evidence with a suspect. Interestingly enough, private investigators work under a burden created by ethical constraints that police detectives do not labor under. While courts have consistently held that police may lie to a suspect to stimulate a confession without tainting that confession (we once saw this in an episode of the TV series The Closer), very few private investigators can credibly present statements obtained by deceptive means. By “very few” we mean in the few instances where the PI has investigated an individual who’s extremely unsavory or has committed a particularly heinous act, jurors are more likely to trust that PI’s statements, even if the PI lied to obtain them. This is great fodder for a story. In a crime scene, the area searched and the evidence sought will depend on the crime under investigation. In crimes of violence, the crime scene tells the detective what happened but the detective has to be able to read the signs left by the evidence (signatures of crime include fingerprints, blood stains, bullets, bullet holes, tool marks, fibers, hairs, glass fragments, fingernail scrapings, DNA samples, as well as items added, overturned, removed or displaced). Keep in mind that the suspect is also part of the crime scene. What does she leave at the crime scene and what does she take away from the scene? Such evidence helps to prove that she was there. If the police take her back to the crime scene after her arrest, the evidence of her presence at the scene, when presented in testimony in the courtroom, may serve only to prove that the police took her there. This may cause your fictional PI to think twice before taking a possible suspect to a crime scene. It's important to make the distinction between what crime scene investigators for the police consider a crime scene and what the rest of us, including PIs, consider a crime scene. In the latter instance, a crime scene is really just the place where a crime happened, which has returned to everyday use. However, what police and crime scene investigators consider a crime scene is that area where, such as the space inside the yellow tape, careful protocols for evidence recording and extracting are followed. Let’s cover some important concepts about how the police process a crime scene. Your fictional PI might be called on to critique how a crime scene was processed in the course of his investigation, or he might be called on to process his own. Check condition of victim and arrange medical treatment if necessary. Secure and protect the crime scene (keep in mind the possibility of a multiple series of crime scenes). Is further search legal? If not, need consent. If a law enforcement officer, obtain a search warrant, especially if a major felony. Search, sketch and document. Precise measurements of the crime scene should include an accurate sketch containing a key, a scale and a legend noting the day, time, location and conditions (weather, lighting). Compass directions should be noted on the sketch. Remember that a measuring tape provides a wonderful standard of comparison especially when photographs or video are employed. Document the crime scene and its physical evidence. In law enforcement, a videographer typically accompanies an assigned officer on the initial walk-through. Overall as well as specific photographs are taken of the crime scene. Close-up photographs should be taken of important items of evidence (for example, footwear impressions). Handle the evidence so as to not contaminate it. Collect, mark and catalogue evidence. Preserve the evidence in a central, organized location. When Police Aren’t Available: What Might a PI Do? A PI investigating a major crime scene risks being charged with obstruction of justice and/or tampering with evidence. If a private investigator was called on to process a crime scene for evidence of any nature, he/she would follow the same above steps. However, it cannot be stressed enough that a PI would call on police to handle a major crime scene, like a murder or arson. To handle, test and collect evidence could easily result in charges of obstruction of justice and/or tampering with evidence. For that reason, any PI who wanted to avoid jail would call 911, and would scrupulously avoid touching anything at the scene of a crime other than to assess a victim’s medical condition. On the other hand, having a sleuth character charged with several crimes after exploring a major crime scene would certainly bump up the story tension! There are times when a PI does handle evidence, and the best protocol is to collect the evidence with gloves, place it in a plastic/paper bag, seal that bag with tape and initial the bag with the PI’s initials and the date it was collected. Your fictional PI may collect evidence for admission in court when that evidence was not collected by the police (or the opposing side in a civil case) and the evidence supports his client’s case. For example, several years back Colleen and a group of PIs from other states worked together to trap a seller selling fraudulent products via an online marketplace. The evidence collected were the products being sold (and, in a sense, the online marketplace where this buyer sold his fraudulent products was the crime scene). After Colleen purchased the products (using another identity to not tip off the seller), she’d place the products in a plastic bag, initial the bag with her name, product name and date, then seal the bag and mail it to the attorney handling the case. These products were used as evidence in a court case against the seller. This wraps up Part I. Link to the next class: "Private Investigators and Crime Scene Investigations, Part II." All rights reserved by Colleen Collins. Any use of this content requires specific, written authority. I originally wrote this article for PI Magazine's December 2010 issue. These guidelines were written with private investigators in mind and provide handy info if you have a private eye character who must testify in court. The section under "To be most effective when testifying" has tips for any character who's taking the stand at a trial. Or turn a tip or two upside down and make a more conflict-filled situation in your scene! The ultimate presentation of an investigation is testifying in court, either before a judge or a judge and jury. The idea is to make an effective, articulate and organized impression on the fact-finder (the judge or jury). If, as a PI, you were hired by an attorney, together the two of you will most likely prepare your testimony directly from the investigative reports you authored. Keep in mind that the reports themselves are not presented as evidence because they meet the definition of hearsay; however, well-written, clear, and informative reports support the testimony and help the lawyer immeasurably. If you were hired by a citizen, you need to make sure they read your reports. The burden is on you to make sure your client’s questions are organized, written down, and that they have rehearsed their direct examination of you. Make eye contact with the jurors. If you look at the attorney when answering questions, it might look as though you’re unsure of what you’re saying or that you’re asking for help. Answer yes or no whenever possible. Never explain an answer, nor volunteer anything! Avoid equivocal or qualified answers. Use simple terms, common language. Be mindful of a jury's sense of fairness. Know the facts, but don’t repeat the testimony word for word as though it were memorized. (This tip applies specifically to PIs) Don’t bring your investigative file to court. Anything you have in your hand (whether you’re on the stand or in court) can be admitted into evidence at the request of opposing counsel. On the other hand, think how it could bump up the stakes if a file carried into court becomes evidence...even more interesting, what if the PI-character had planned that all along. Perhaps the most important tip is to remain respectful of the court, the judge, the opposing counsel, and especially yourself. Besides being a writer, I co-owned a private investigations agency for a decade with my husband/PI partner, who has since returned to being a criminal defense attorney. I tell you this because our lives are full of M.O.M., from crafting stories to trying homicide cases. In U.S. criminal law, M.O.M. encapsulates three sides of a crime necessary to convince a jury of guilt in a criminal proceeding. Did the defendant have a motive to commit the crime? Did the defendant have an opportunity, or chance, to accomplish the deed? Did the defendant also have the ability (means)? Ways a Character Might Use M.O.M. Below are four examples for how a private eye/sleuth character might employ motive, opportunity and/or means. An investigator might ask questions about a character, which could shed light on motive. There’s the direct questions a sleuth might ask, and which we often hear in movies, such as “Where were you at nine o’clock on the night of April 12, Miss Smith?” (opportunity). But also think about your sleuth asking questions that delve into a suspect’s character (motive), history of violence or peacefulness (means/motive or lack of means/motive), or knowledge about using a certain type of weapon (means). A sleuth might also interview other people who’ve seen that suspect use the same type of weapon or conduct certain violent acts. Let’s say your sleuth wants to prove the killer was someone other than the person charged with the crime. Your sleuth might looks for clues that show lack of means on the murder weapon (such as bloody hand imprints that are larger than the defendant’s or a strand of hair stuck in blood that's a different color than the defendant’s). Your sleuth might reconstruct the event at the scene of the crime to prove a person had access to a weapon (means) as well as opportunity. For example, the reconstruction might show how easily a suspect could have reached for the murder weapon. Or, conversely, that the suspect wasn’t tall enough to reach the weapon, strong enough to lift it, or maybe even literate enough to have read the instructions on how to use the weapon. As a lawyer, Abraham Lincoln once reconstructed a crime scene to prove that a witness couldn’t possibly have seen what she claimed to have seen because there wasn’t ample lighting to clearly see at the time the incident occurred. Your sleuth might research other people who had motive, opportunity and means to commit a crime. For example, the sleuth might analyze someone’s character for motive (such as his/her history of outbursts toward the victim), look for clues tying another person to the murder weapon (for example, his/her knowledge of how to use that weapon), or establish someone had opportunity (by analyzing a person’s timeline). Keep in Mind: A court cannot convict based solely on motive, opportunity and means. A lawyer must provide convincing proof of all three. Obtaining this proof is, of course, what your sleuth (a detective, private investigator, amateur sleuth) has been doggedly investigating, with the help of MOM, throughout the course of your story.